Immigration, education, and employment are often quoted as the top priority issues on which Latinos vote. But emerging research shows that Latino voters also care greatly about environmental issues and the reasons for their concerns are deeply personal. Latinos along with other communities of color are disproportionately more vulnerable to the impacts of environmental hazards and climate change leading to increased suffering due to lack of clean water, clean air and climate policies and programs to address the growing crisis. By all metrics, the most polluted air in the country is in the Los Angeles-Long Beach region and in various regions of the Central Valley all with a large low-income Latino population. The Los Angeles-Long Beach area has the nation’s largest Latino population (5.8 million in 2011, or 44% of the total population) and it ranked first in ozone pollution and fourth in particle pollution. 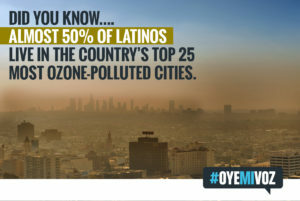 Nationwide, almost 50% of the Latino population lives in the country’s top 25 most ozone-polluted cities. Air quality is only one indicator among many that point to the environmental injustices Latinos experience. Other factors to consider are access to clean and safe water and latino neighborhood’s proximity to toxin-producing factories, oil refineries, and freeways. These environmental hazards coupled with poverty, pre-existing health conditions and lack of health coverage, leave Latino communities at risk of serious health issues ranging from asthma, other respiratory conditions, heart attacks, cancer and more. According to a report by the Environmental Defense Fund, Latinos are three times more likely to die of asthma than any other race or ethnic group. 79% said it was very to extremely important that the state of California address global warming and climate change. 81% said it was very to extremely important that the state of California reduce air pollution from oil and gas. 75% support the state to provide financial assistance for low-income families in buying low emission cars. 87% said they would like to see more “Green Jobs” in the Latino community. 81% agreed that state government should devote more resources to address environmental issues and pollution in Black and Latino communities. The numbers speak for themselves. Latinos are affected by environmental issues, understand them as political issues, and need elected representatives to take action to ensure Latino communities are healthy and thriving. What do YOU need in your community? We’d love to hear your thoughts, experience, and hopes for how to ensure Latinos live in healthy environments – please join the conversation on Facebook and Twitter and let us know what you think. And don’t forget to register to vote – together we can elect representatives that will address the needs of the Latino community. With 17 Days Left to Register to Vote, Will Latinos Step Up to the Challenge?